Accounting clay envelope Mesopotamia was the first place where crop surpluses were produced to such a degree that enough labor was freed that it could be harnessed to build cities and monuments, produce art and crafts and support merchants, temples and monarchs. The Sumerian used the world’s first writing to record economic transactions and participate in a trade network that extended over thousands of miles. The Babylonians are credited with expanding commerce and developing an early banking system. Most of the early writing was used to make lists of commodities. The writing system is believed to have developed in response to an increasingly complex society in which records needed to be kept on taxes, rations, agricultural products and tributes to keep society running smoothly. 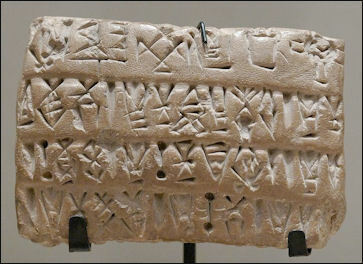 The oldest examples of Sumerian writing were bills of sales that recorded transactions between a buyer and seller. When a trader sold ten head of cattle he included a clay tablet that had a symbol for the number ten and a pictograph symbol of cattle. The Mesopotamians could also be described as the worlds first great accountants. They recorded everything that was consumed in the temples on clay tablets and placed them in the temple archives. Many of the tablets recovered were lists of items like this. Royal seals were affixed to products. Book: Snell, Daniel C., Ledgers and Prices: Early Mesopotamian Merchant Accounts. New Haven: Yale University Press, 1982. 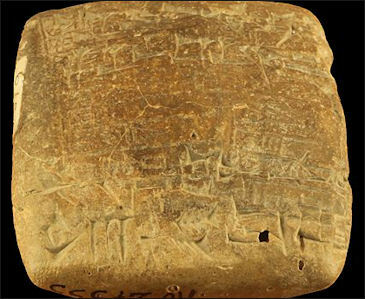 Economic tablet from Susa Organized production of handcrafted good was first developed in Mesopotamia. The Sumerians produced manufactured goods. The weaving of wool by thousands of workers is regarded as the for large-scale industry. The Sumerians a developed sense of ownership and private property. It seems like many business transactions were recorded and the minutest amounts and smallest quantities were listed. Contracts were sealed with cylinder seals that were rolled over clay to produce a relief image. There wasn't much in Ur and other cities in Mesopotamia except water from the Euphrates River and mud brick made from the dry earth. Prized materials such as gold, silver, lapis lazuli, agate, carnelian all were imported. The difference between the silver rings used in Mesopotamia and earliest coins first produced in Lydia in Anatolia in the 7th century B.C. was that the Lydian coins had the stamp of the Lydian king and thus were guaranteed by an authoritative source to have a fixed value. Without the stamp of the king, people were reluctant to take the money at face value from a stranger. Archaeologists have had a difficult time sorting out information on ancient money because, unlike pottery or utensils, found in abundant supply at archeological sites, they didn't thrown them out. 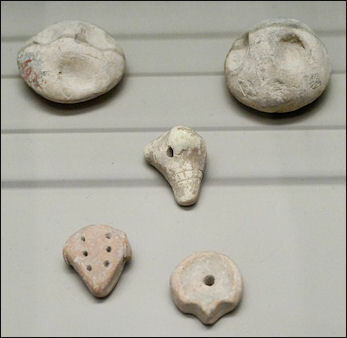 Clay accounting tokens The earliest form of trade was barter. The earliest known proto-money are clay token excavated from the floors of villages houses and city temples in the Near East. The tokens served as counters and perhaps as promissory notes used before writing was developed. The tokens came in different sizes and shapes. Early Mesopotamians who lived in the Fertile Crescent before the rise of the first cities employed five token types that represented different amounts of the three main traded goods: grain, human labor and livestock such as goats and sheep. 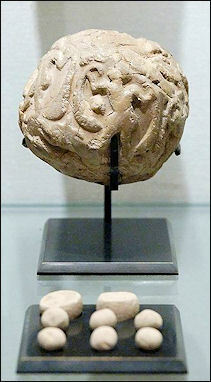 Clay tokens, described by some scholars as the world's first money, found in Susa, Iran have been dated to 3300 B.C. One was equivalent to one sheep. Others represented a jar of oil, a measure of metal, a measure of honey, and different garments. In the Mesopotamian cities, there were 16 main types of tokens and dozens of sub categories for things like honey, trussed duck, sheep's milk, rope, garments, bread, textiles, furniture, mats, beds, perfume and metals. Thomas Wyrick, an economist at Southwestern Missouri State University told Discover, "If there were a thousand different goods being traded up and down the street, people could set the price in a thousand different ways because in a barter economy each good is priced in terms of other goods. So one pair of sandals equals ten dates, equals one quart of wheat, equals two quarts of bitumen, and so on." "Which is the best price? It's so complex that people don't know if they are getting a good deal. For the first time in history, we've got a large number of goods. And for the first time, we have so many prices that it overwhelms the human mind. People needed some standard way of stating value." In Mesopotamia, silver became the standard of value sometime between 3100 B.C. and 2500 B.C. along with barley. Silver was used because it was a prized decorative material, it was portable and the supply of it was relatively constant and predictable from year to year. Sometime before 2500 B.C. a shekel of silver became the standard currency. Tablets listed the price of timber and grains in shekels of silver. A shekel was equal to about one third of an ounce, or little more than three pennies in terms of weight. One month of labor was worth 1 shekel. A liter of barely sold for 3/100ths of shekel. A slave sold for between 10 and 20 shekels. No long after shekels appeared as a means of exchange, kings began levying fines in shekels as a punishment. Around 2000 B.C., in the city of Eshnunna, a man who bit another man's nose was fined 60 shekels. A man who slapped another man in the face had to pay up 20 shekels. Receipt for clothes In the early days of shekels, people carried pieces of metal in bags and amounts were measured out on scales with stones as countermeasures on the other side. Between 2800 B.C. and 2500 B.C., pieces of silver were caste a standard weight, usually in the form of rings or coils called har on tablets. These rings, worth between 1 and 60 shekels, were used primarily by the rich to make big purchases. They came in a number of different forms: large ones with triangular ridges, thin coils. A 3,700-year-old tablet from the Euphrates River town of Sippar recorded a bill of sale of a woman who bought some land with a silver ring, worth the equivalent of 60 months wages for an ordinary worker, that she received from her parents. To pay their bills ordinary people used less valuable money made of tin, copper or bronze. Barley was also used as currency. The advantage with it was that small weighing errors made little difference and it was difficult to cheat someone. The use of money made trade easier between city-states and kingdoms and well as between Mesopotamia, Egypt and Palestine. The main problem with silver is that it was so valuable that weighing errors or impure silver should translate to a large amount of lost value. Some people tried to purposely cheat others by adding other metals into gold or silver or even substituting look-a-like metals. Fraud and cheating were so prevalent in the ancient world that there are eight passages in the Old Testament that forbid tampering with scales or substituting lighter for heavier stones. People often fell into debt---a conclusion based on numerous tablet letters describing people in various kinds of trouble for falling into debt. Many debtors became slaves. The situation got so out of hand in Babylon that King Hammurabi decreed that no one could be enslaved for more than three years for debt. Other cities, with residents racked by debt, issued moratoriums on all outstanding bills. The text on a cuneiform tablet detailing a loan of silver, c. 1800 B.C., reads: “3 1/3 silver sigloi, at interest of 1/6 sigloi and 6 grains per sigloi, has Amurritum, servant of Ikun-pi-Istar, received on loan from Ilum-nasir. In the third month she shall pay the silver.” 1 sigloi=8.3 grams. “A definite area was bound to find a bowman together with his linked pikeman (who bore the shield for both) and to furnish them with supplies for the campaign. This area was termed "a bow" as early as the 8th century B.C., but the usage was much earlier. Later, a horseman was due from certain areas. A man was only bound to serve so many (six?) times, but the land had to find a man annually. The service was usually discharged by slaves and serfs, but the amelu (and perhaps the muskenu) went to war. The "bows" were grouped in tens and hundreds. The corvee was less regular. The letters of Hammurabi often deal with claims to exemption. Religious officials and shepherds in charge of flocks were exempt. Special liabilities lay upon riparian owners to repair canals, bridges, quays, etc. Sales and Purchases Contracts from Mesopotamia in 2000 B.C. Contract for the Sale of a Standing Crop, Seventh year of Cyrus, 532 B.C. : This contract belongs to a class intermediate between rental and the sale of land. Instead of either, the standing crop is sold. : “From a cultivated field which is situated on the alley of Li'u-Bel, Itti-Marduk-balatu, the son of Nabu-akhi-iddin, the son of Egibi, has made a purchase from Tashmitum-damqat, daughter of Shuzubu, son of Shigua, and Nadin-aplu, the son of Rimut, son of Epish-Ilu. Itti-Marduk-balatu has counted the money, the price of the crop of that field for the seventh year of Cyrus, King of Babylon, king of countries, into the hands of Tashmitum-damqat and Nadin-aplu. (The names of two witnesess and a scribe then follow) Babylon, Ululu thirteenth, the seventh year of Cyrus. Contract for the Sale of Wheat, Thirty-fifth year of Darius, 487 B.C. : This tablet is a good illustration of the simple transactions in food-stuffs, of which we have many, and of which one or two additional examples are given below. The farmers usually contracted as in this document the sale of their produce far in advance of the harvest. In this instance the sale was made six months before the grain would be ripe and could be delivered. Six talents of wheat from Shamash-malku, son of Nabu-napshat-su-ziz, to Shamash-iddin, son of Rimut. In the month Siman, wheat, six talents in full, he will deliver in Shibtu, at the house of Shamash-iddin. Witnesses: Shamash-iddin, son of Nabu-usur-napishti; Abu-nu-emuq, son of Sin-akhi-iddin; Sharru-Bel, son of Sin-iddin; Aban-nimiqu-rukus, son of Malula. Scribe, Aradya, son of Epish-zir. Shibtu, eleventh of Kislimu, thirty-fifth year of Darius king of countries. Rental Contracts from Mesopotamia in 2000 B.C. Contract for Rent & Repair of a House, One Year Term, Thirty-fifth year of Darius, 487 B.C. : This contract is most interesting. Iskhuya, apparently a tenant of Shamash-iddin, undertakes to repair the house in which he is living. In addition to the rent for the year he is to receive fifteen shekels in money, in two payments, at the beginning and the completion of the work. The last payment is to be made on the day of Bel, which seems to be identical with the first of Tebet, a week later than the contract was made. In case the repairs were not then completed, Iskhuya was to forfeit four shekels. Such business methods are not, therefore, altogether modern. Co-Partnerships Contracts from Mesopotamia in 2000 B.C. Contract for a Partnership, Fortieth year of Nebuchadnezzar II, 564 B.C. : From this document we learn that Iddin-Marduk and Nabu-ukin formed a copartnership in the month Tebet, of Nebuchadnezzar's fortieth year. A year from that date each of the partners drew out twenty shekels. In the month Ulul of the next year a number of small amounts were delivered to Iddin-Marduk for various specific purposes, and a larger amount, perhaps in payment of an obligation of the firm, was paid to two other men. “According to the ethical principles governing the Code, the directors of a bank would be responsible to the depositors for losses incurred through the business transactions of the bank. The protection of the debtor in business transactions against the tyranny of the creditor is carried almost to an extreme; it would appear that the creditor cannot attach the property of his debtor without obtaining the authority of the court; and if. e. g., he has helped himself from the granary of the debtor without the latter’s permission, although he may not have taken more than the amount of the debt, he must return what he has taken, and by his wilful act forfeits his original claim. The courts regulated the hire of cattle for ploughing or other purposes, the wages of mechanics and labourers, the hire of ships for freight, the amount of the return for the farming of fields, and even the fee of surgeons for operations—all with a view to affording protection against both extortion and underpayment. Loans and Mortgages Contracts from Mesopotamia in 611 B.C. Bankruptcy Contracts from Mesopotamia in 560 B.C. II.6. Before he takes field or house for silver, three times in a month of days the buyer shall make proclamation in the city of Ashur, and three times he shall have proclamation made in the city in which he would buy the field and house. Thus: "Field and house of so-and-so, son of so-and-so, situated in the cultivable area of this city I am buying. Such as are in possession or have no objection, or have any claims on the property, let them bring their tablets, let them lay before the magistrates, let them present their claims, let them prove their title, and let them take what is theirs. Those whl during this month of days cannot bring even one of their tablets to me, lay them before the magistrates, receive in full what belongs to him." If the buyer shall have made proclamation, they shall write their tablets, the magistrates shall give them to him, saying: "In this month of days, the buyer made proclamation three times, >He who in this month of days brought not his tablets to me, did not lay them before me, shall forfeit his claim to share in field and house.' To the one making the proclamation, who is a buyer, it shall be free."